Where the wild mechanics roam…. I’d loaded Ruby the Exxy (my car) up with a load of typewriters and headed south to Beaudesert. It was a nice day for a drive in the country, and John had suggested that I come out and have a bit of a typosphere hangout with him. 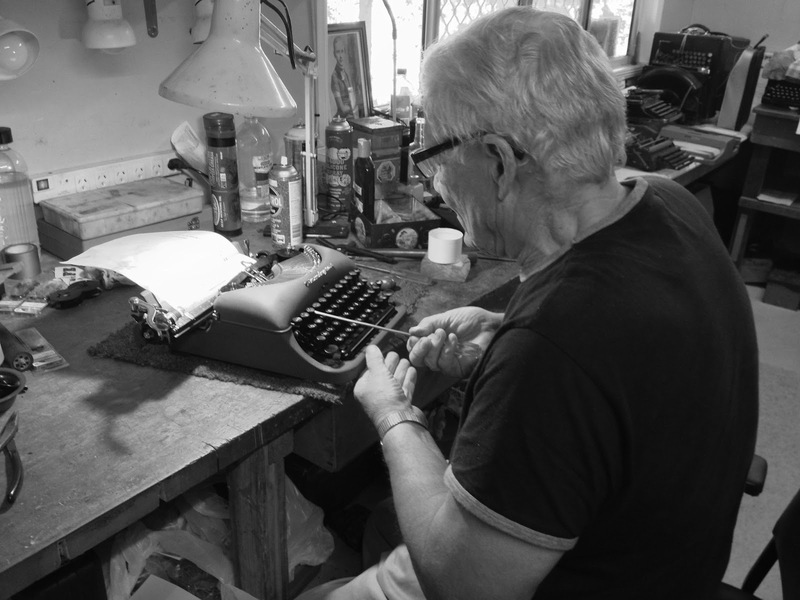 On this occasion, I had the company of ‘the impatient typewriter mechanic‘ – Steve Snow in the car with me who also had brought a handful of machines along for the ride. Steve was great company for the drive, and the weather could not be more perfect for the trip. Last time I was down that way, the temperatures were exceeding 40 degrees C. This time, it was a modest 22. And soooo much more comfortable. Which was just as well, as we spent at least 7 hours in John’s workshop. John had invited me to bring whatever machines needed the his experienced hand to look at. So I took the opportunity to bring some of my more interesting machines, which also had some faults that had to this stage proven a bit beyond my current skills. I had three machines of a defective nature, and I had also brought two just to ‘show and tell’. The 6th machine in my car was a machine I was giving John, in exchange for a surplus small air compressor that he had. Steve also had some machines for John to look at. Chiefly, he had a Smith Premier 10A that had a few issues that he wanted to see if John could do something about. Steve made some really interesting progress on his machine, and I think he’ll be writing about it quite soon. So I’ll let him tell you all about it. Meanwhile, John took a crack at fixing the three machines of mine that I’d brought with me. We made good progress on my Olympia SG1, but it is still a bit munted in a couple of keys. We identified the problem with my beautiful pearl Olympia Monica, and a part is on its way to me already courteously of Barry Fielden in the UK – via Will Davis’s Portable Typewriter Yahoo group. 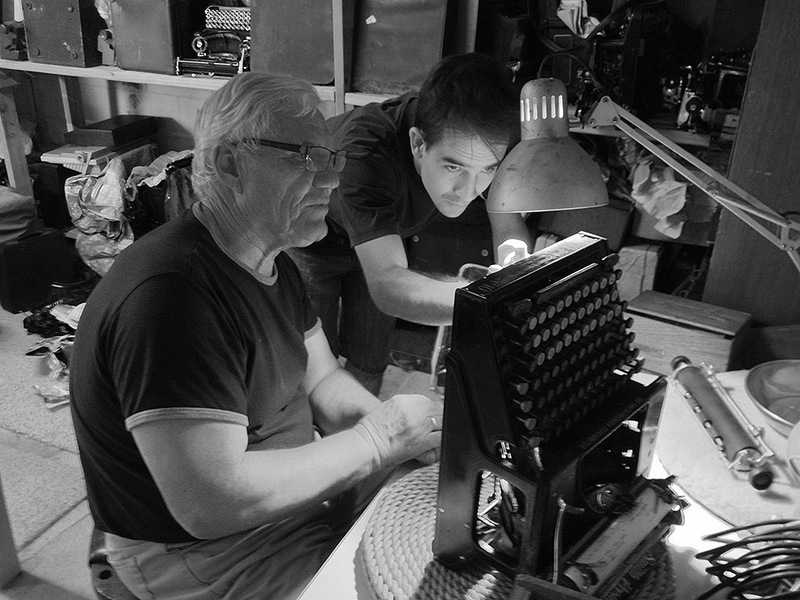 John also blitzed adjusting my Remington 5’s action, and after the machine’s extensive repairs it is now a 100% working piece of beautiful machinery. But more on that machine soon. However, the two machines that I had brought just to show – also got a round on John’s workbench. I was happy with the operation of both machines, but now John has assessed some problems that I hadn’t even thought about, and without even thinking he was making adjustments and suggestions on the two of them. It seems that John’s repair man instincts seem to be forever in his blood. Both Steve and I had a great day. 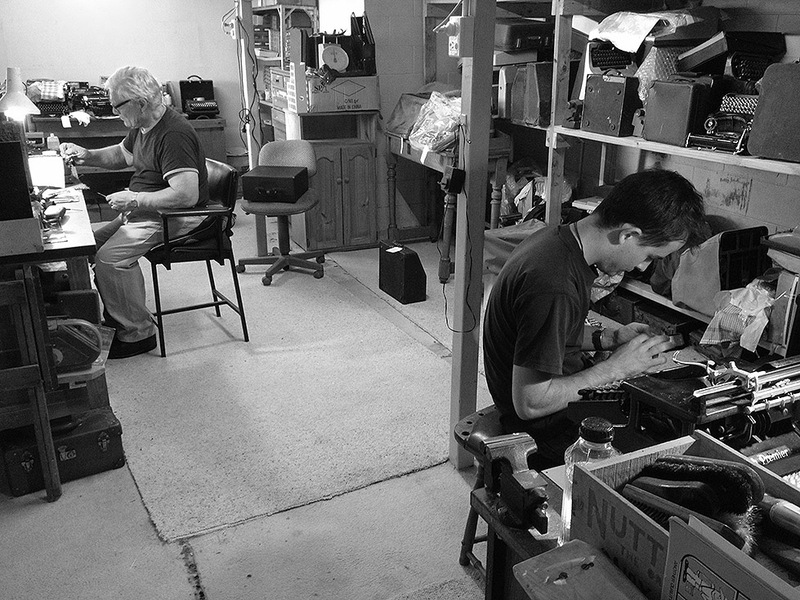 Not only did we get to get our hands on some real typewriter service tools, but we both learned an awful lot from John. I’ve learned how to use some of the professional’s tools, and I picked up quite a few little techniques. Watching John in action is great. He just rips through stuff that usually takes me a lot more time to achieve. And while he worked, he he was telling us magnificent stories about his working days that are very entertaining and interesting. John’s been talking about getting his own blog going, which I am very excited about. Steve and I are going to give him a bit of a hand where we can. Another great part about visiting John’s place, is that we get to have a look through some of his machines. A lot of his 400+ machines are still packaged up and concealed in cardboard, bubble wrap, newspaper and old carpet. Every so often Steve and I would see a hint of something that looked sort of familiar, and we’d ask John if we could take a look. John was quite obliging, and we got to crack open the wrapping and have a look at some magnificent machines. I was especially wrapped when I got to get my hands on a gorgeous Groma Kolibri in Burgundy. It typed better than I expected, and I now feel an urge to hunt one down for my own collection. They are such an amazing little machine! 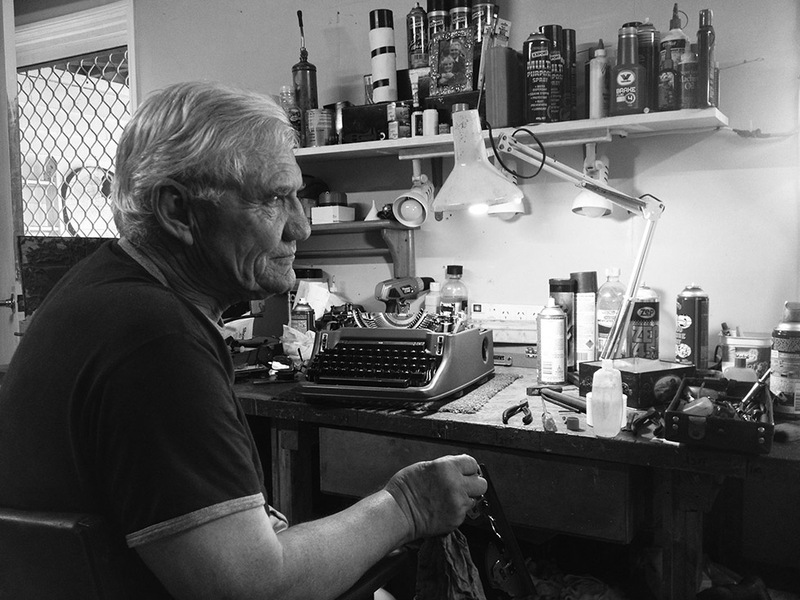 It is easy to spend all day in John’s workshop, and I always love hearing about what he’s got on his workbench that is currently being worked on. Both Steve and John are great to hang with, and it is a real privilege to been able to spend the day with them. Thanks Guys. Hope to catch up again soon. 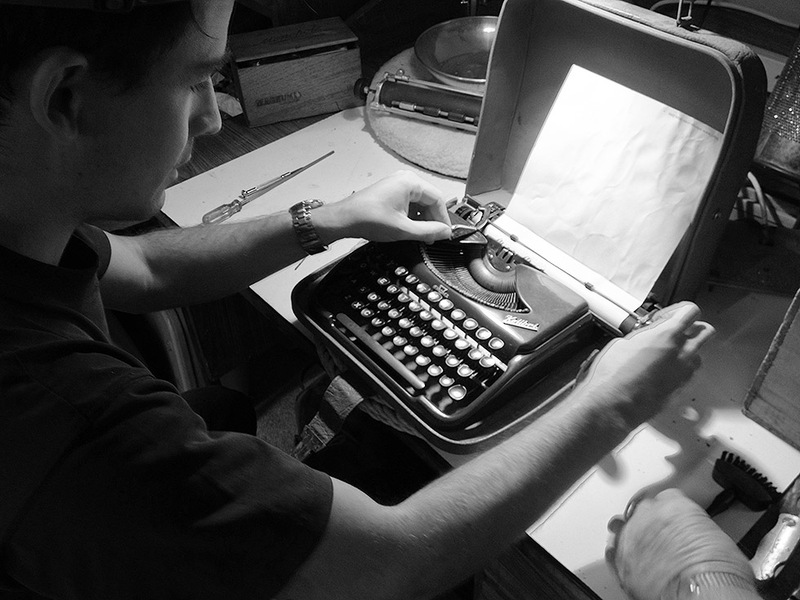 May 4, 2013 in fixing, Groma Kolibri, John, Monica, Remington, repairs, SG1, Steve, tools, travel, typewriters. A mid summers day drive. John’s collection. I’d buy that for a dollar, or three. ← Hey, Robert Messenger! Meet Kermit. I drop by MTE at least a couple of times a month lately, not always with a technical question or a balky machine. Sometimes just to shoot the breeze for a half-hour, and see the new machines he's got in for repair. Usually quite a few – there are a lot of people getting their typewriters fixed these days. I take that as a good sign. Looks wonderful. I hope John will indeed start a blog. Wonderful story and amazing pictures! I hope you find your Kolibri. Love it! Hope to see John in the Typosphere soon. Ah! I have one close to where I work, and he's an interesting chap to talk to. But I feel he's a bit reluctant to talk about his days repairing the machines. There seems to be quite an increase in people getting their machines looked at, which can only mean one thing – there is an increase in the people using them. Which I find especially exciting. Me too. I think it will be a fascinating read! Thank you very much. And as much as I'd love to get a Kolibri, I may have to hold back on financial grounds. I'mn sure he will be. I love the ever expanding nature of the Typosphere. great field trip! A bit like going to an old-school repairman working away in his bunker, keeping the flame alive 🙂 Maybe he can do some workshops! Well, you might just have to come with us on the next run, Rino!